What did Shakespeare’s English sound like to Shakespeare? To his audience? And how can we know such a thing as the phonetic character of the language spoken 400 years ago? 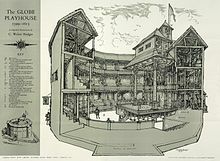 These questions and more are addressed in this video, which profiles a very popular experiment at London’s Globe Theatre, the 1994 reconstruction of Shakespeare’s theatrical home. This entry was posted on October 4, 2015 by Vox Populi in Opinion Leaders, Poetry and tagged Ben Crystal, David Crystal, Globe Theatre, Shakespeare's original pronunciation.